Find out for release date details about the rapper's comeback single. After weeks of teasing fans about her comeback with a new look, Nicki Minaj has announced that her new single will be called 'Pills N Potions'. The track will premiere this Wednesday (21st March) and the announcement has been trending on Twitter since it was announced at the Billboard Music Awards. 'Pills N Potions' will feature on Nicki Minaj's third album 'The Pink Print'. Describing the single, Nicki said: "It sounds like urgency. It sounds like betrayal. It sounds like running. It sounds like fainting. It sounds like love. It sounds like -- *gasp! 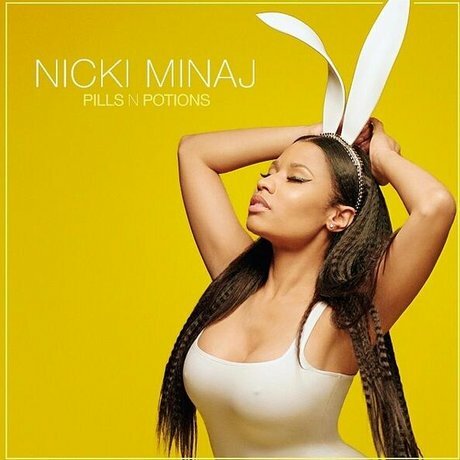 *"
The artwork for 'Pills N Potions' sees Nicki wearing a white top and bunny ears. We can't wait to hear it.